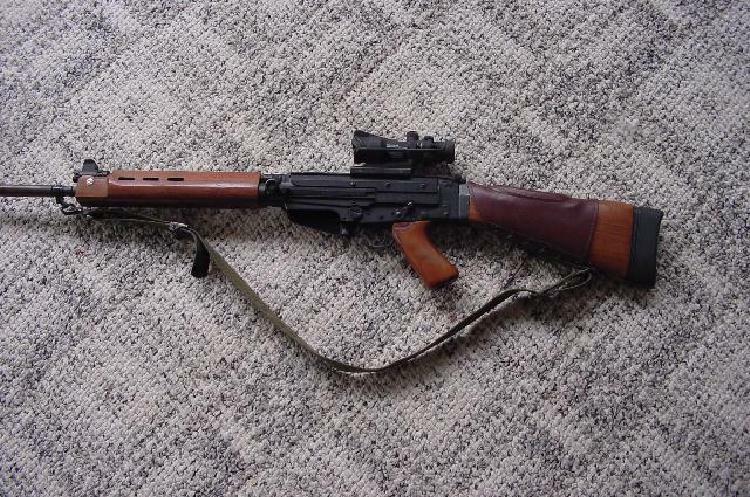 Quote Reply Topic: Scope for FN/FAL? So I'm finishing up my Argy upper/DSA lower (waiting on the right size locking shoulder), and my thoughts have turned to "what scope"? FN/FALs are not known to be tack drivers, and that is OK with me. Iron sights are OK, but not my personal choice. I've got a DSA scope mount for it, so that is where I am heading. Intended use is general range fun, not likely to exceed 100 yards (cause that is what my home range has), maybe some three gun, SHTF, and general close in zombie suppression. I'd like illumination, as it doesn't hurt anything, and makes a real difference in low light. 1) How do you like the CQB reticle? does the horseshoe obscure too much of the target? How about the level of illumination - ok during the day or wash out to black? 2) any thoughts on overall durability? as good as I've heard? I've thought about the 1-4 variables, and that has some merit. But I have not seen any yet with a reticle that really grabbed me. Maybe the new SS will do it, but that won't be for a while. The Vortex Viper PST looks good as well, but that also won't be out for a while - and I'd rather get something that has been wrung out for a generation. So - other recommendations in the $500-600 range? the ior works well, on the fns, as does the mk4 1.5x5 leo, and the acogs. since the ior has no bell it will mount low on the fn, (I use low leo prw) which is needed due to the stock design. the ior is not a floating reticle and when using the bullet drop turret, the shooter can watch the reticle move against the inside of the scope (old school). the horse shoe is 10 moa at 100m inside (why not 100 yds is beyond me) and blocks observations of bullet strikes at 300 + yds. the inside dot is 1 moa and is good for 8x10 steel at 500 yds which your rifle should easily do. the bdc turret is set up for 168 grs and works great. but the strange part is the vertical hash marks are then in 1mil. the reticle does not go edge to edge but floats, which is its most outstanding feature. The new SS would do well to follow this with a 1 mil thick horseshoe and the same 1 mil marks and 5 mil larger. Windage mark hold offs on a 4x scope ?--- well, no comment. 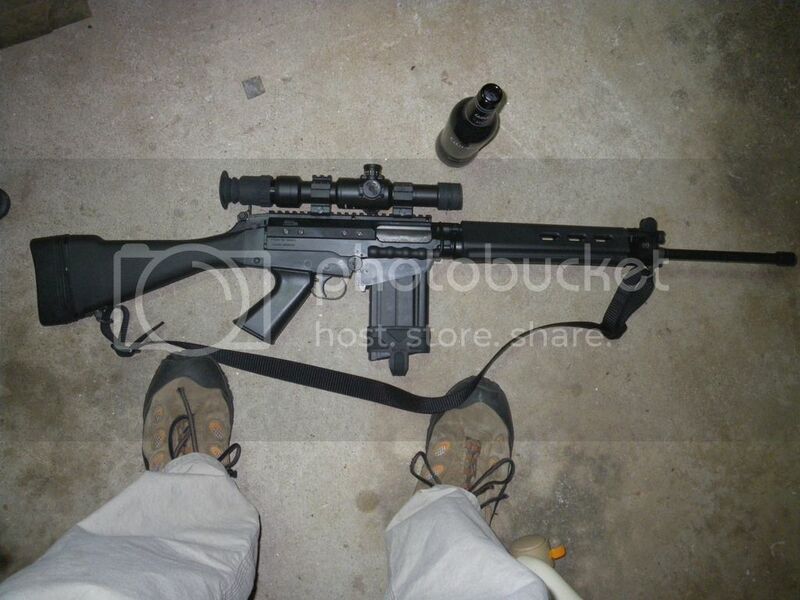 The leo spr is a modified german #4 with hold, offs in the reticle, and bdc adjustable elevation turret. The hold overs and drop turret work well on 8x10 steel, out to 500 yds. (about 10 moa or 3 mil) at any power even though its sfp proably because of the low mag. range of the scope. Ratios starting at 4x and up start to see the problem of poi change. A good way to go would be a regular leo 1x4 send back and have a spr put in. The acogs have limited eye relief and mount to high. you should look at the new Magpul adjustable stocks for the fns, -- it solves alot of the eye relief problems and mounting problems. I have the IOR 4x on a AR-15. All in all I really have been happy with that scope. It is consistent, very very durable, glass is quite good, BDC works pretty well even with 55 grain bullets out to 400 to 500 yards, adjustments are nice and tactile, and most importantly it just always works when I need it to. It is not perfect in every way, but I have yet to own a scope that is. I have recommended it to several friends who have also been very happy with them. I have the Ta442 and really like it but there are several trijicons that would work well. note the mounting position of the acog on the fn , which is as far back as it will go. This and the limited eye relief will put your head on the end of the cheek riser, and with the ht, of the acog gives very little solid cheek weld. just on a note on the tack driver misconception and usable accuracy on fn,dsa type guns. while they may be only 1 moa, very few tack drivers can be fired against the clock for accuracy and time for 60 plus rounds. Don't I know it - ran my clubs' rifle match last summer with my M1A SuperMatch - 64 rounds for me (perfect would have been 51) at ranges from 10 - 100 yards. By the last two 8" plates at 100 yards, I definately assumed the proper kneeling stance - no way to do those standing up. Should be funner with the FN/FAL - can't see dropping down to my 16" AR, just because - just because someone has to show what 7.62x51 is all about. No doubt when the gongs get pinged that way (I damm near broke the lollypop off last time). 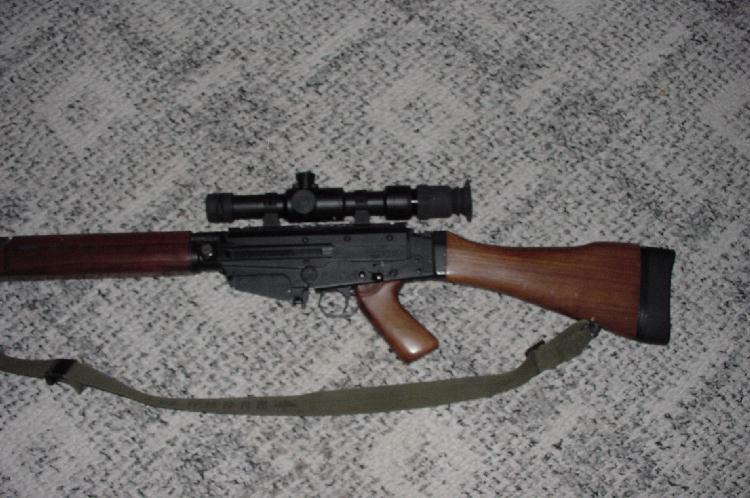 I have a DSA SAR58 with a DSA mount. This is truly a tack driver ! So much so that I moved my 10 X Hensoldt sniper scope from my M1A supermatch to it. It shoots way better than I can. We are talking sub moa. I use to think this was a standard battle rifle with that kind of accuracy but it's not. I have heard plenty of stories about why, mechanically, a FAL is not capable of this. I, personally, tell you this is not so! Maybe a Super Bad build could be poor but my DSA is not one of those. Plese double click on the pictures to open them up. This will also take you to my PhotoBucket page where you can brouse if you like. my locking shoulder should come in from DSA next week. using pin gages, I should end up just over (i.e., .001-002) minimum headspace, which should help with the inherent accuracy. Locking shoulder installed. IOR low mount rings were just a hair too low, so an existing set of burris xtr mid-size got the call. nice set up, what do think of the reticle so far? the scope gets a 10+ for funky look on that gun. I really like the illumination, and the ranging circles seem pretty functional. Have not yet had the chance to try out the BDC function (or even sight it in for that matter).